In-game injuries are obviously a huge addition, as the feature has been missing from NBA Live since the last generation. Please note that the option is disabled by default, but after it’s enabled, you should see players going down with injuries on hard collisions. I haven’t had an opportunity to test out the feature in Franchise yet, but it’s obviously a step in the right direction. The City Edition courts are automatically activated upon selecting the home team’s City Edition jersey. I’ve amended the notes for Patch 1.19 in the update history for NBA Live 19 over in our Wiki. Once again, feel free to share your thoughts in the comments below, as well as in this topic in the NLSC Forum! 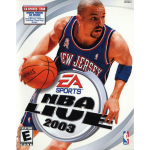 There’s a certain novelty in seeing current players and team branding in much older basketball games, as today’s file additions for NBA Live 2003 demonstrate. 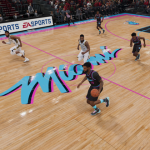 Download a couple of 2018 City Edition jerseys for the Miami Heat and New York Knicks at the links below!